Are there differences when working with light-colored palm sugar versus dark? Depending where I get my palm sugar from, it's either light brown colored and quite hard (pictured left), or a very dark brown color and much softer (on the right). Are these different types of palm sugar? I sometimes note the one on the right is called coconut palm sugar and comes from Singapore. The one on the left looks Vietnamese. Are either suitable for recipes calling simply for palm sugar? 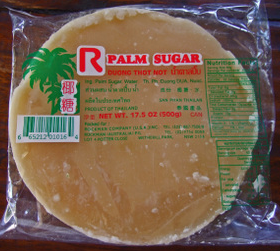 The pale-colored disks of palm sugar have a mild taste, and can be used for any recipe which calls for palm sugar, or for that matter light brown sugar. It's that not strongly distinct from granulated sugar in flavor; personally, the only reason I use it is for texture. The dark brown palm sugar has a distinct caramelized, even somewhat burnt flavor. It adds considerable, distinct, flavor to a dish, even a heavily spiced one. You should use it in dishes which are specifically supposed to have a palm sugar flavor, but should be careful using it in recipes which say things like "Palm sugar or granulated sugar". It's really like brown sugar vs. molasses. Sometimes you can substitute them, but not always. There are probably also ethnic differences in which one you want to use for what, but I don't have enough experience of Southeast Asian cuisines to tell you that. The one on the right appears to be more pure. The one on the left, because of it's very light color may be mixed with cane sugar. 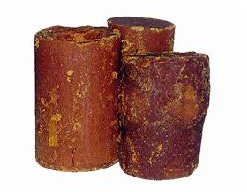 The process of making coconut palm sugar requires the boiling of the coconut palm nectar, which caramelizes the nectar, therefore giving it a dark color. The lighter color is common with coconut sugars that are mixed with cane sugar. Not the answer you're looking for? Browse other questions tagged substitutions sugar or ask your own question. What are the tradeoffs replacing sucrose / table sugar with pure granulater dextrose / glucose? What nutritional differences are there between honey and table sugar (sucrose)? How does “Brownulated” light brown sugar compare with regular light brown sugar? What is a close alternative to Graeffe brown sugar?